Most of my Saturdays now are spent on Lib Dem campaigning, and that will continue to be the case until the all-up elections next May. But I bunked off at lunch-time today to meet up with lady_lugosi1313 and hit the Howl Bar in Leeds (exactly as gothic as it sounds) for a talk by Dacre Stoker about his great-grand-uncle, Bram. Dacre is the co-author of Dracula, the Un-dead, which I reviewed in these pages a few years ago (LJ / DW). He also crops up pretty regularly as co-author of or contributor to other Dracula-related publications and in person at Dracula-related events. But this was the first time I'd had the chance to hear and meet him in person myself. I'm going to be honest and say my expectations were not spectacularly high. I quite enjoyed his novel in and of itself, but found the way it was framed and marketed incredibly irritating. I've also formed the impression from his appearances in other contexts that his enthusiasm for his family, and particularly for the self-publicity opportunities which the background creates for him, often over-rides whatever sense he has of historical or aesthetic discrimination. In person, though, I really warmed to him. That same enthusiasm for Bram and everything to do with him is infectious, and he's actually a very personable and quite funny presenter; a feat I particularly appreciate given that I know he's currently doing the talk we saw today every couple of days on a tour of the UK. It's not easy to keep it sounding fresh in those circumstances, but he's managing it. He even tailored it all very nicely to the select but dedicated audience he had in front of him, asking us all about our own interests in Bram / Dracula, remembering what people had told him and referencing it within the talk, and also asking us pop-quiz questions periodically and awarding Reese's chocolate eyeballs for correct answers. He was also very much on top of his material, fully apprised for example not only of the recently-published Icelandic version of Dracula but also of the Swedish one which came to light earlier this year. He even acknowledged that people often over-claim about Dracula and made a point of signalling when his comments were based in attested fact and when he was speculating. I disagreed with him on some points. For example, I don't believe that the Swedish or Icelandic versions of the novel were based on a lost early draft of Bram's work, for the reason I stated in my review of the Icedlandic one (LJ / DW): if so, why are there only a few very minor points of connection with Stoker's working notes? But that's a difference of opinion on an issue open to debate, and I appreciated the fact that he was only sharing his opinion on the matter - not being dogmatic about it. Other topics which he covered included Stoker's research process, his various sources of inspiration, the type-script of the novel and what it reveals about late edits, and the many and varied adaptations of the story. I wouldn't say I learnt huge amounts I didn't already know, but that is because I've read a lot about the topic myself and went to a whole conference about it last autumn. 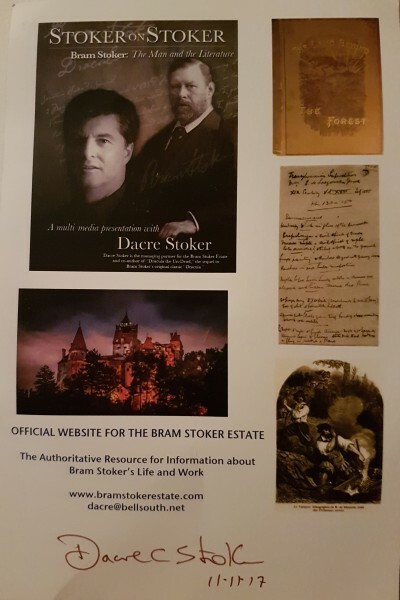 But I did learn a few snippets, such as for example that at least two of the books which Stoker consulted as part of his research contained (fairly schematic / idealised) drawings of Bran Castle. So although the castle has nothing whatsoever to do with the historical Vlad Dracula, it is actually fairly reasonable to say, as many Romanian tourist websites do, that it was the (or at least an) inspiration for the castle in Bram's story. I think the absolute wisest thing Dacre said, though, was in relation to Dracula's many stage and screen adaptations, and particularly the common complaint that they don't follow the story as originally told in the novel. He touched on this in particular in relation to the 1992 film, and people complaining that Francis Ford Coppola had inserted a love story into it. Dacre's position on this was that if we'd all kept telling the story exactly as Bram did for 120 years, we'd be pretty bored by now (and, of course, would probably have stopped long ago). So we should be grateful for the many creative minds who have all taken their own inspiration from the book, and developed it in hundreds of different directions. Absolutely. I agree.